Details relating to the Estonian Commemorative of 2016. 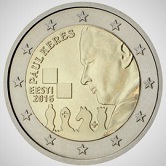 This coin, the first commemorative coin issued by Estonia, honours the great chess player Paul Keres and was issued to commemorate the 100th anniversary of his birthday. Keres, although he never won the title of world champion, was one of the all time greats in the game of chess and was a grand master of both Estonia and the Soviet Union. In the inner circle we see a portrait of Keres looking down at a chess board which is represented by two squares. Also shown are four chess pieces – a pawn, a bishop ,a knight and the queen. The name “PAUL KERES” appears on the edge of the inner circle between nine and eleven o’clock. Just below nine o’clock is the name of the issuing country and the year of issue – “EESTI 2016”. Return from Estonian Commemorative 2016 to euro coin collector.